Another amazing blog post and pic by Bambi! Dates have been exteneded through October 7, 2015! heard giggles and squeeeeels of pleasure! and I knew she was working on a second-to-none witch ensemble!! and finally an IM asking if she could use my texture! And it turned out beautifully! 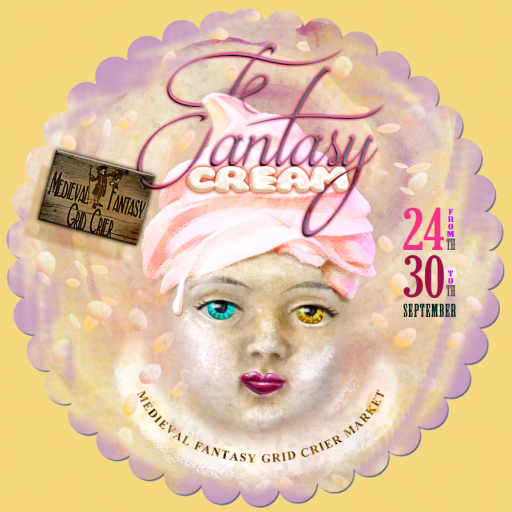 BlueMoon enterprise is honored to take part in the Fantasy Cream MFGC market! Merchants show one exclusive creation purposely made for the event. The Visitors of the FANTASY CREAM Market are invited to vote for their preferred exclusive creation among those shown in the voting area. BMe Witch Hazel Wood is a bewitching dress that hides many secrets. 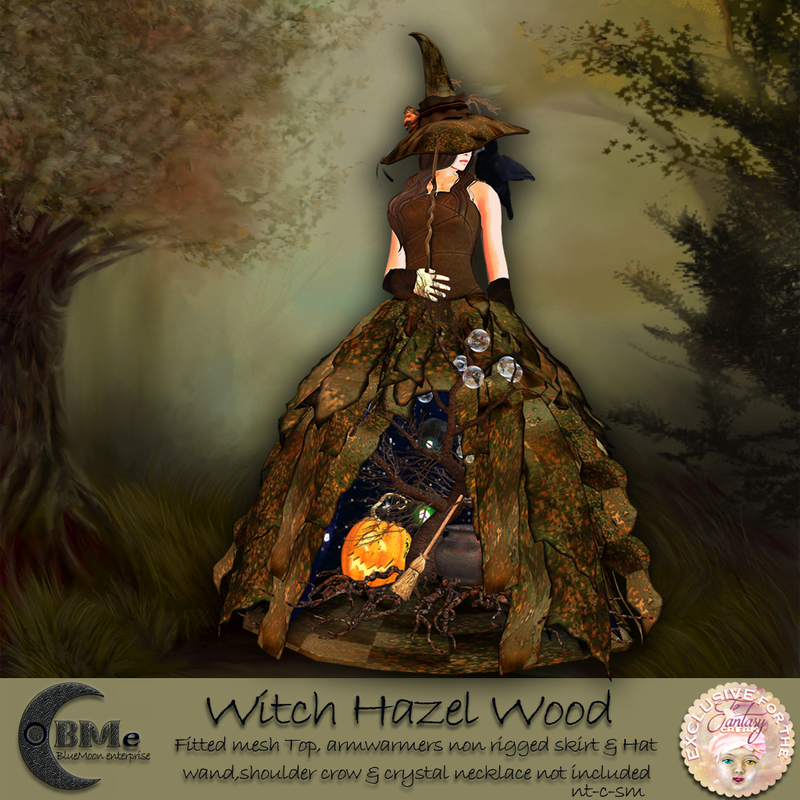 The unrigged mesh skirt is layers upon uneven layers of a beautiful autumn harlequin texture designed for me by Bambi Chicque, inside the skirt you’ll find a gnarly dead oak tree, jack a lantern, bubbling cauldron, and crow. The top is a RIGGED FITTED MESH leather patchwork corset with short skirt that work with SLINK mash avatar, CLASSIC avatar, and most other mesh avatars. Woolen arm warms and a floppy coordinating hat finishes the outfit. BMe Fantasy Cream Hunt Items are unisex and everything a witch needs, Wand, crow that sits on your shoulder and crystal neck charm. to get everyone in the mood for Halloween! Each Designer was asked to showcase their favorite items and provide a hunt gift! and it will run through October 31, 2015!! Grab your broom and fly to the event! for the event and I went NUTS to say the least. around “colors” and texture mixes and whimsical and…. well you have to come see for yourself!!! This showcase festival shines on the creativity, imagination and beauty of 12 of Second Life’s most excellent fantasy creators. Each creator was asked to pick their favorite items to feature at the showcase. In addition they will offer a free hunt item in the seasonal theme. Come join the fun and collect your hunt pumpkins with each fantasy creator. Great gifts. Great items. Great Fun. Get your boo on with us.